I bought one of these Gorillapod tripods last spring and finally made up my mind to take it out in the woods and see how handy it is for hiking. Your camera’s tripod mount can affect how well it works. Canon A-series cams like mine have the mount absurdly installed on the left-hand side, which makes balancing tricky because the cam wants to fall over to one side. Less of a problem on those really small compact cameras, assuming they have tripod mounts. Don’t be lulled by all the tricks it can pull. I set mine up on a rock looking down at a pool of reflecting water, set the timed shutter release (mandatory, I’ll get to that next) and waited. Not that I’m prone to seeing the dark side or anything, but suddenly the image of my cam falling into the creek flooded my brain. Didn’t happen, but I can see how it could. Bottom line: Keep your hands near the cam so you can grab it if it slips. Why timed shutter release is mandatory: Because it doesn’t hold your camera firm like normal tripod would. It’s kinda floppy. If you try to click the shutter yourself while the cam’s mounted on the Gorillapod, you’re apt to get enough shake to defeat the pod’s purpose. So, learn how your timed shutter release works and give it 10 seconds to let the cam stop shaking after you let go. Overall it’s a handy little doo-dad for day hikes, but no substitute for a real tripod. There’s also a larger size for big-body SLRs, though I gotta say I’d be reluctant to rest a thousand-dollar camera on one. But seriously, little portable tripod-like devices like this really do have their uses. Back in a time when I also shot with a film point and shoot camera while backpacking I used to carry a very small tripod-like device that was just large enough to support a small camera on top of a conveniently placed boulder, allowing me to get those all-important self-portraits on solo pack trips. 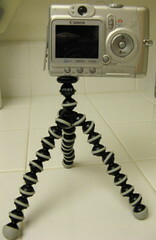 May I assume that the real reason to have a GorillaPod is not the flexibility of configuration but the light weight? Just how much does this gizmo weigh, Tom? Russ: it weighs 1.55 ounces (44 grams) … so compared to the weight of some tripods it’s like a feather. As Dan notes, it’s great for getting into nooks and crannies, and taking self-portraits. That’s pretty light alright. I might have to go ape over it! I have never seen a camera with the tripod mount way over to one side like that. But I couldn’t help but notice that you might do better with forming the support “legs” to better compensate. You can form the legs into more of an arch, and even extend one leg out further to make it more stable. Maybe we could have a contest to see who can come up with the best gorillapod sculpture. I made some stop-motion animations with mine that looked pretty cool, but I think they got tossed or deleted. My cam, a Canon a710IS, weighs 9.45 ounces, which is just barely within the weight limits for the base model (9.7 ounces) … I did have some trouble with the cam wanting to sag, but goofing with the legs helped compensate.